We don't know when this Place of Worship was founded, but we understand it was closed by 2005. 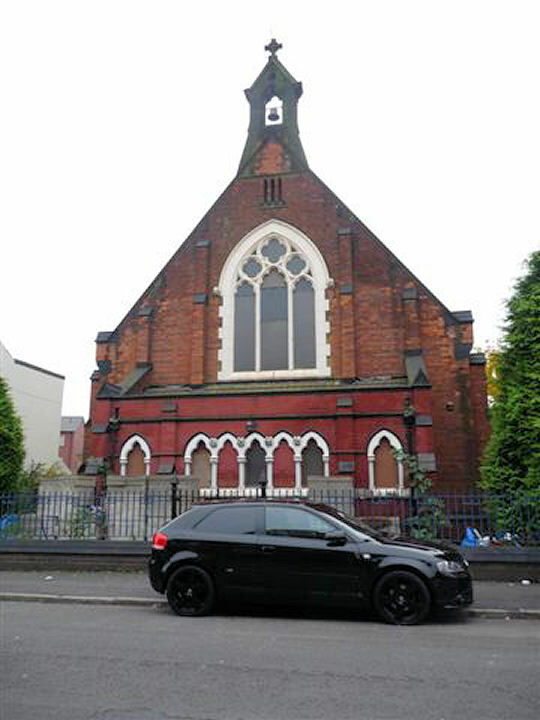 This building was previously St Christopher's Church, mentioned as a Chapel of Ease to St Thomas's (in Pear Tree Road) by the Derbyshire Record Office's catalogue of Church of England Registers, and in Kelly's Directory of 1912, which provides its address as Shaftesbury Crescent. As "St Christopher's Mission Church", it is shown on Old Maps of 1951-1952 at the same location as the building in our photograph. It is listed in Places recorded by the Registrar General under the provisions of the Places of Worship Registration Act 1855 (2010) as "St George's Ukranian Autocephalous Orthodox Church" with a congregation of "Ukrainian Autocephalous Orthodox". However in actual fact it has now closed. An article "Bid to build flats on disused church site" published in the Derby Telegraph website on 3rd June 2010 makes this apparent in its statement that "St George's Church, in Shaftesbury Crescent, Normanton, has not been used for five years after numbers of worshippers dwindled" (so closed by 2005). Now or formerly Ukrainian Orthodox. St George's Ukrainian Orthodox Church, Normanton, Derby shown on a Google Map. Information last updated on 6 Nov 2014 at 13:42. This Report was created 28 Mar 2019 - 22:52:52 GMT from information held in the Derbyshire section of the Places of Worship Database. This was last updated on 6 Feb 2019 at 15:49.